We used a Adafruit Flora, Accelerometer, Piezo, Conductive Thread, Li-po Battery, NeoPixels, headband and lasercut personalized plexiglass icons. The icons were cut out of Plexiglass with a laser cutter and then attached to a store-bought headbands that we shaped with a sewing machine to fit the wrist. The Flora and accelerometer were attached with conductive thread. We then loaded the code to produce sounds and light effects depending on X,Y and Z coordinates and acceleration. The sounds were compiled from a sound library created by MIT and the lights using Adafruit NeoPixel library. The hardest part was discovering the X-Y-Z access thresholds for the gestures that trigger the sound. We have three unique gesture sets that trigger three different sounds. Part of the fun is finding those gestures and discovering the sounds we programmed. 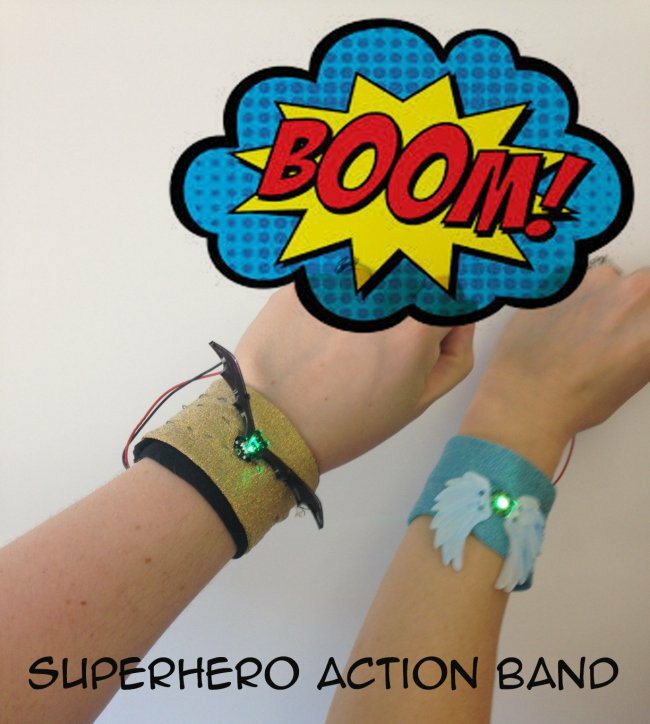 We prepared a How-To tutorial for all the superhero makers out there to make your own! You can also see the band in action in Make Magazine.